Bring your guitar and join a guitar class! See how fun and easy it is to play the guitar! It's so easy we'll be making music from the very first day! Using the proven method of the Austin Classical Guitar curriculum and various games, will have fun while students learn all aspects about playing the guitar. 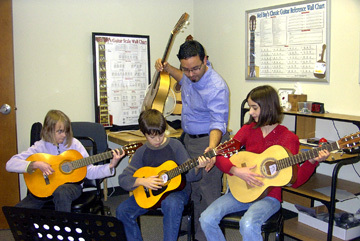 Guitar classea are fun-filled music lessons with games. Classes are designed to get your children not only playing the guitar but making real music using proper rhythm and dynamics. Students will build confidence as they learn to make music in a group setting. Please call to be put on our list for the next guitar class.